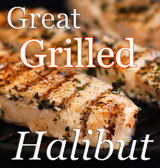 The best fish alternative to fillet mignon! Pearl Harbor day. There’s not a huge amount of meaning for my generation except that it put us squarely into World War II. And It’s got me craving tuna. I’ve been craving Ahi Tuna, the way I stumbled on making it the day after my first and only trip to Pearl Harbor. I didn’t even see any connection until today; now I see that maybe it was meant to happen all along – it’s only a flavor thing, after all. But I’m feeling definite freedom from the way everybody else has their tuna. Let me back up a bit. I’ve never really gotten the whole ‘my tuna is barely cooked’ thing. When I went to see my friend Glen in Honolulu last spring, I was so glad he took us to Duke’s on Waikiki Beach, because Duke’s isn’t all about serving raw tuna – it’s about serving fish. Oh, and it just so happens to have a drop-dead view of the most beautiful beach in the world. A little while after I came back to Seattle, I tried to replicate the dish. I’ll be the first to admit I got somewhat off track. I used different spices, a different thickness, and different veggies to go with it. But what I want to convey, is that whole ‘freedom’ thing. Duke’s kitchen was the catalyst that told me it was alright to not want to eat it any way I wanted as long as it was raw. Duke’s actually served me a good portion of ahi tuna that was cooked medium! Thanks, Duke’s. Now I get it. Tuna can be almost, well, like fillet mignon if it’s done right. So here you go – my version of beefless fillet mignon. If you can’t find Za’atar, it’s available online at World Spice Market. And forget any hangup you might have with arugula; it’s perfect for this dish. Enjoy! Cut tuna into 4 ounce pieces, rinse with water and remove to a paper towel-lined plate to drain. Mix za’atar and salt in a small bowl. 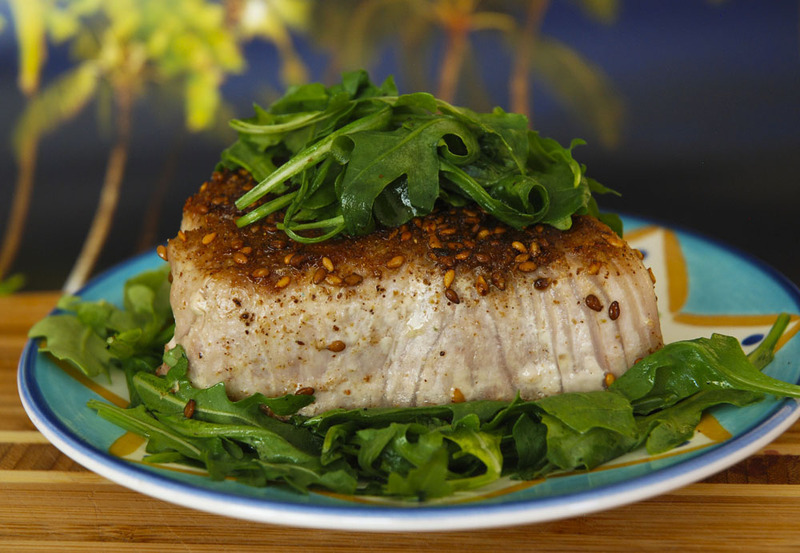 When the tuna has lost its wet sheen, coat it top and bottom with this spice rub. 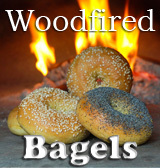 Let sit 15 minutes or more at room temperature. Heat 1 Tablespoon oil in a non-stick pan over medium-hot flame until fairly hot. Cook 2 pieces of fish at a time (use two or three pans if you can here). You will see the cooked crust move up from the bottom. It will take 2 minutes per side if you like your tuna rare, or 3 minutes per side if you like it medium. Turn to cook the other side and remove to a hot plate. Clean out the pan, and use the remaining Tablespoon of oil to sauté the arugula for 1 minute, until just wilted. Divide the arugula among 6 plates, put a piece of fish on top and serve hot.